Today we crossed the Topic of Capricorn. A landmark event, and about time too! 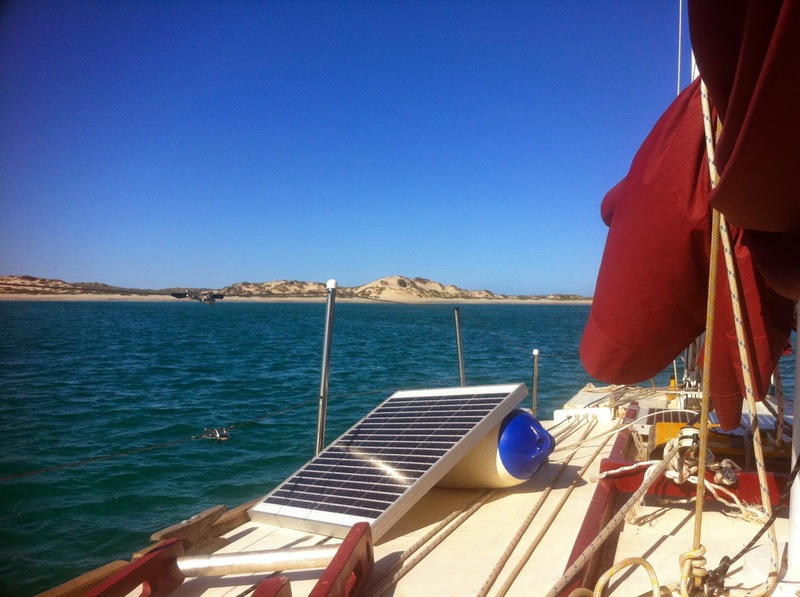 After 3 weeks in Carnarvon, extended because of nasty low passing over in the last week, we and several other boats, “the Carnarvon crew” set off on a Friday morning. To heck with superstition - something about bad luck to start a voyage on Fridays. We had bad luck on a voyage which we started on a Thursday, so much for that! It was 120 Nm to Coral Bay, and the anchorage at Mauds Landing so it was to be an overnighter, not our favourite distance.. The wind was a gentle 10 to 12 knots on the stern and Ashiki cruised along at 3.5 knots. 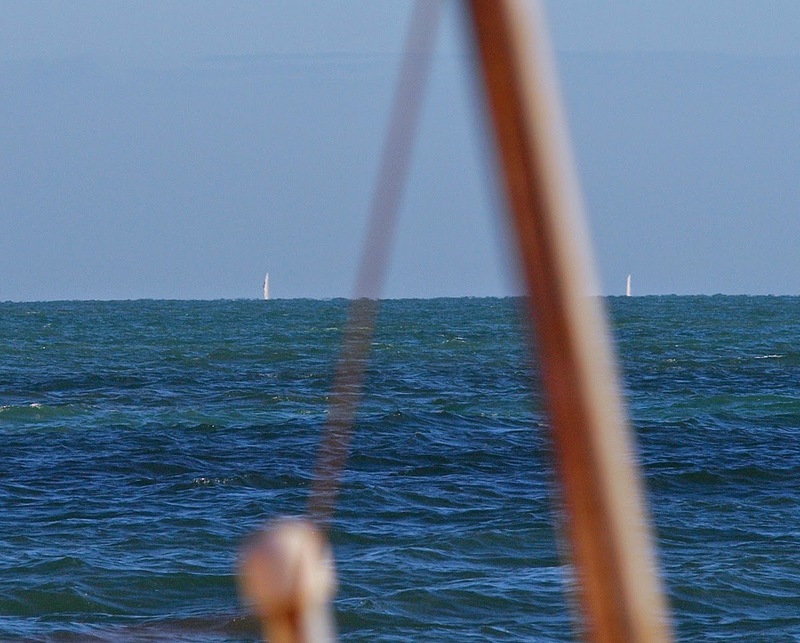 A couple of catamarans and a large ketch who started half an hour before us were on the horizon and within 2 hours were gone from sight. I speculated they were motor sailing and found out later I was right. Motorsail to maintain a steady 5 knots. The big ketch I was told was motorsailing at 8 knots and "waited for no man".. Good for them. The wind did pick up through the day and it was a great sail. The wind vane didn’t cooperate much at all. More major changes on that front I think. We did entertain the idea to pull into Cape Cuvier, only a 40 Nm trip but on approaching, it looked more industrial than entertaining. Huge jetty, huge cliffs, massive lighting in the dusk. It is one of those Rio Tinto salt mining places and I didn’t want to spend a night in the salt mines… So decided against it. We continued on through the night, during Susie’s shift at 2am and myself asleep, the radio jumped to life. 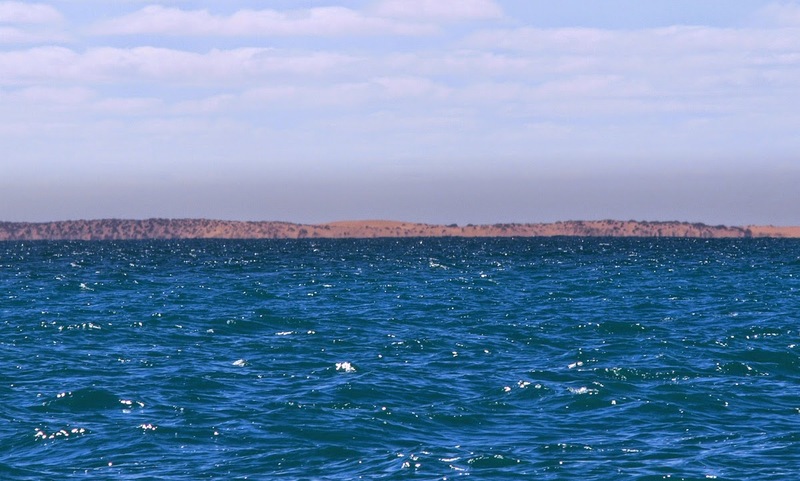 It was Kliff, one of the Carnarvon crew off our port beam, the only cruiser in a power boat, a trawler yacht. He sits on 6 knots so it was only a matter of time he would catch us, and was pretty cool having a chat out in the ocean with another boat. 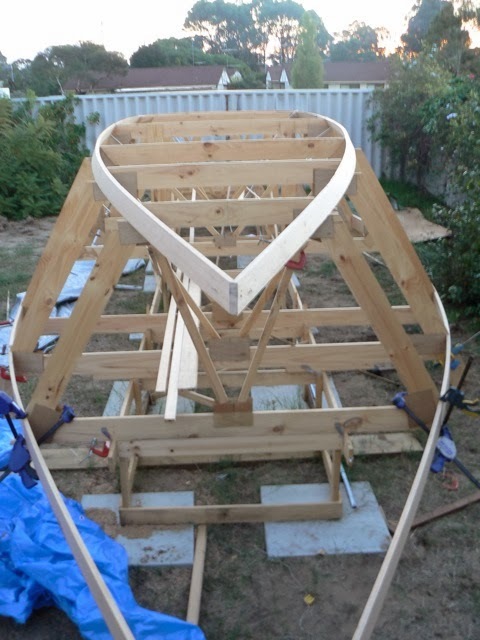 He had passed the “pirate boat” - a 60’ gaff rigged schooner 7 hours before, they had left after us and were sailing with their new square rig sail. Something they needed as heading northward up this coast the wind is mostly astern. They weren’t going any faster than us despite twice the waterline, because they appear to be quite under canvassed. Kliff said Ashiki barely came up on his radar, amongst the waves, which at that point were becoming boisterous. This is of concern, since I piled plenty of alfoil into the wooden portions of the masts, the bottom half of the them are large aluminium pipes too, so should be able to reflect some radar beam… (on another day with less waves around, Ashiki came up clear is a bell, well, a solid blob on the screen. Nothing to worry about after all.) The trawler then took off on an oddly out to sea course, rather than our parallel to the coast course. Doesn’t he know in a SE’er the waves are bigger further out or maybe he knows something we don’t? At 4am, after already heavily reefed, the wind began to shriek, which to me indicates 35 knots or over. Looks like a another nasty gale to deal with and Susie uttered her displeasure of overnight trips. We dropped the foresail so we were bare poles, I lashed the tiller to the middle and Ashiki kept a straight downwind course, the direction we wanted to go, at 2 to 2.5 knots and we went below to sleep it off. This worked surprisingly well! Ashiki doesn’t need sails up to sail a good course. I had the pilot berth in the stern, as this one is designated for the off watch crew, the crew on watch gets the settee berth in the middle of the hull - because it is easier to climb in and out of. But I think my berth is the uncomfortable one in a following sea. Some waves hit Ashiki square on the starboard quarter (right hand back of the hull) right where I was trying to sleep and I felt it! During the morning I heard Susie open the hatch to check the horizon a few times, next thing I know it was light, looked outside and saw Susie steering. She had raised 3 panels in the foresail by herself and we were cruising along at 4 knots in the still fresh breeze and swells. She didn’t want to waste the daylight hours bare poles and wanted to get to the anchorage sooner. Little while later I heard Susie exclaiming she got wet! It wasn’t a huge wave flooding the cockpit, more like lashed by a small bucket full. But its so rare to get wet on Ashiki, she’s such a dry boat, high freeboard and light displacement always rising to the top of any wave. But it was still messy out there, winds 20 to 25 knots, waves steep and to 2m. I relieved her of her duties, raised more panels and soon Ashiki was blasting through the morning light at 5+ knots. 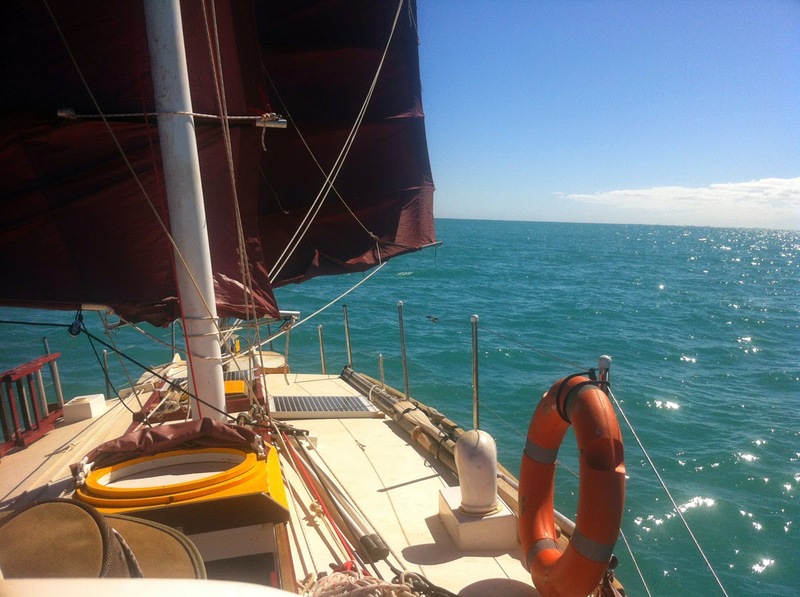 After lunchtime we were rounding the mighty Ningaloo reef, with waves a crashing, and tacking up the bay to Mauds Landing, anchoring near two other boats, both whom we knew from Carnarvon, the cat “Calm Horizon” and the Kliff’s “Power Ready Spirit II”. Comparing notes afterwards over a few cold ones, Kilff’s trawler had trouble with quartering waves, so tried running with them only to be hammered horribly by big swell by going too far out to sea - I get the impression motor boats have a harder time in swells than sailboats. David in the cat had also spent those hours in the early morning bare poles and thought it was leaving on a Friday was the problem. Nah, that night was nothing compared to a Thursday departure we made a couple months ago.. But our problem with last night wasn’t so much the sea, that was handled quite easily, its the fact is was a night sail and the windvane letting us down, which ruined a good nights sleep! Note on speed, Ashiki made the 124 mile trip at 4.05 knots average (burned 1/4L fuel - only at the anchorages each end) the 35' Cat would have done it at 4.75 knots (burned 10L of fuel). Compares very well considering a cat is the faster design.